The Club does not use an advance booking system, members must be at the club to book a court. All members will receive a tag which identifies them as a "paid-up" member of the Club. If you would like to book a court, keep your tag with you at all times and when you arrive at the courts, place your tag on the board. If you have any questions, monitors will show you how to use the board. 1. Keep your tag. You will be issued a new sticker each year which will be placed on your tag. Replacement tags cost $25. 2. Use of the tag board is mandatory during member hours. Members can only play on the court that bears their tags on the tag board. If the court is being used and no tags are on the board, you can assume those on the court are not members. Ask them to finish their game. If they indicate they are members, refer them to this rule and remind them to bring their tags next time. 3. When a monitor/program director is on duty, they have full control over court usage including the tag board. 4. Play time is one hour, based on the clubhouse clock that overlooks the courts. 5. Courts are booked on a first come/first to play basis. There is no advance booking and you must have at least two tags on the board with both members present to hold/use the court. 6. You cannot tag a court and then leave, you and your playing partners must be present at the club when your tag/s are on the board. 7. 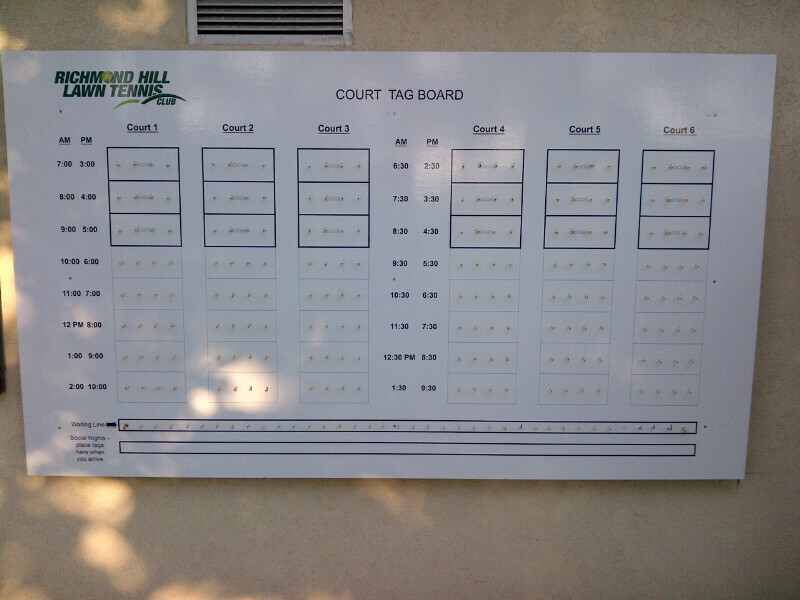 If two players are playing singles and all courts are in use, you and your partner can place your tags on the tag board and join them. If you choose not to join them, place your tag on the next available court time. You cannot join up with them if there is less than 15 minutes before the next change over. 8. If you see 4 players on the court, you must see 4 tags on the tag board. If not, you can assume they are not members. You have the right to ask them to finish their game and give up the court assuming you have properly tagged the board yourself. 9. If the court is unoccupied, you can begin play on that court 15 minutes before the start time. Make sure you have tagged the correct time slot. 10. Players who have just completed the hour play are all required to leave the court and if available, can re-tag a new court. You cannot under any circumstances move another members tag if at least two tags are on the board. 11. Tags cannot be lent out and the tag on the board must be the tag of the player on the court. Misuse or abuse of the tag board system will result in suspension or termination of membership. YOU ARRIVE AND REMEMBER TO PICK THEM UP WHEN YOU LEAVE. Private lessons will be taught on Court 4 by the Club Pro or his or her assistant. The Pros are allowed to tag up in advance of lessons and they may block off sections of the tag board for lessons. Members taking lessons must place their tag on the board when taking lessons. Courtesy, reasonableness and a sense of Club spirit shall prevail when resolving any disputes. Failing that, disputes are to be resolved by the Club monitor or an Executive Member. Breaking of the booking procedures should be written‐up with date, time, name of members involved, etc., and forwarded to the Club President for review and action. Recognized tennis attire is required. Jeans, muscle shirts, cut‐offs, casual shoes and sandals are not permitted. Men must wear shirts at all times. The entrance gate at Court 3 & 4 should be used when entering and exiting Courts 3 and 4. A maximum of 4 players are allowed on a court. Spectators are not permitted on court. A courteous and respectful sense of fair play is expected of all members and guests. Tennis etiquette is to be used for ball retrieval, talking on court, court change over etc. The following is not permitted on Club grounds: load outbursts, abusive/vulgar language, disruptive behavior,gum, spitting, alcoholic beverages, animals, roller blades, skateboards. Cell phone use on the courts is discouraged. Harassment of any type will not be tolerated. Club staff and executive members have the authority to ask any member who is engaging in inappropriate activity/behavior to immediately leave the Club grounds for the balance of the day. Failure to comply will result in suspension or termination of membership. Courteous discussions between members and club staff/executive members regarding club issues are welcome, however, continued on‐going discussions (regardless of tone) which are viewed as harassment by club staff/executive members will not be tolerated. Members engaging in this behaviour will be asked to leave the courts immediately and an incident report will be filed with the club manager and/or executive member. Membership may be terminated, if the Club executive determines that the conduct of the member is unseemly or is in breach of the rules & regulations. A written warning will be emailed to the email address on record. Our club is committed to providing you with an enjoyable tennis experience, fair play and adhering to the spirit of the rules will make this enjoyable for all.